Bought as Christmas gift for sister in law. She loved them. Appeared to be nice quality. 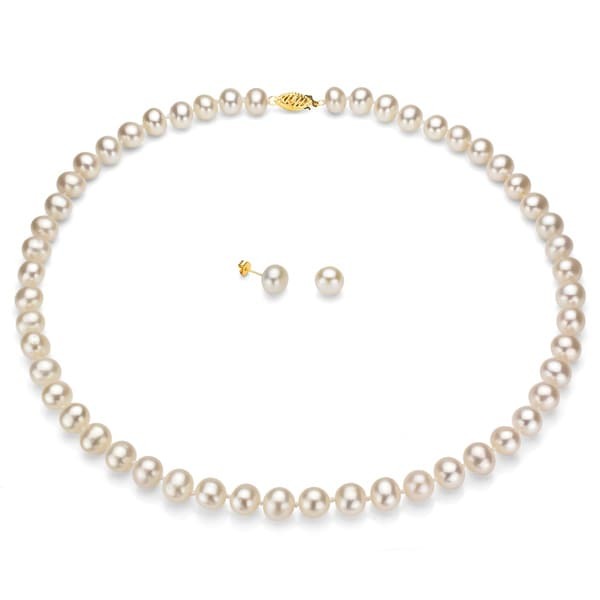 This jewelry set features white, round freshwater pearls that are given a grade AAA rating, accented by 14k yellow gold clasps. The hand-knotted necklace comes with beautiful pearl earrings, as well as an elegant gift box for a beautiful presentation for any special occasion. A high-polish finish adds an air of grace to this classic jewelry set. Dimensions 18.0 In. X 6.0 In. X 3.0 In. I'm not one to be easily impressed.....but, I have to say, I was shocked at the quality of this set. I bought 3 sets for my bridesmaids.....and wow! .... they are so beautiful. And heavy!!! I was stunned at how heavy the strand of pearls is. Lastly, the box that they came is is beautiful too. Solid wood, with a classy interior. All in all....I would highly recommend this set. This was my first experience with Overstock.com.....and I'm thinking....it won't be my last! I compared a lot of products and decided to go for this one because all those excellent reviews. I had a high expectation on the necklace but I am pretty disappointed. The necklace is not white; it has a little bit pink. The grading says AAA and the shape is round. I would say the shape is nearly round not round. The pearls are not really high-quality. I bought a 8mm-9mm 45cm necklace; but the pearls are smaller than the necklace I saw at XXXXXX. The necklace is not bad if you didn't see it very close. I didn't receive the fancy box that others mentioned in the reviews. You get what you pay for. If you really care about the quality, don't buy this one. You can go to retailers/merchandise store and pick a better one for the same price. Not great. I bought these as a graduation present for our babysitter, and I was really disappointed with the quality and the presentation- I got the 6-7mm strand and not a single pearl is round, and none are over 6mm except the weirdly oblong ones. The jewelry box they arrived in was damaged, so it doesn’t close completely. The necklace looks nothing like the picture, earrings I received are noticeably smaller than the pearls on the necklace, and I’ve had the necklace hanging for three hours and it is still kinked up. At this point I’m making the best of it to avoid further hassle. Headline: Pleasantly Surprised! I ordered the 7-8mm necklace and earring set and was very pleased. For a bit more than I would have paid for quality glass pearls, I purchased a lovely set of natural pearls. The pearl necklace was knotted individually between the pearls and most pearls were completely round. The set was delivered in a handsome faux leather case lined with satin. The clasp on the necklace is a bit fussy, but I was happy with the size and luminosity of the pearls in both the necklace and earrings. Pearls are a staple and this set is a solid value. This pearl set was one of my first purchases from Overstock and I was extremely pleased. I was looking for a pearl set for my mother-in-law as a Christmas present. I could not wait for the set to get here! When I received it, I was impressed by the size and incredible luster of the pearls! There is some denting and peaching, but only slight imperfections in a few of the pearls. Too small to see when wearing the set. Wonderful value for the price and comes in a gorgeous box! Bought this for my wife as an anniversary present. The pearls are really something and the box was the perfect touch. The joy on my wife's face was priceless. She thinks I spent a fortune. Thanks Overstock. I bought the freshwater plush box set first but was unsatisfied with the size. i came across this set and can only wish there were more events in my life that would allow me to wear it. The necklace is imperfect and was smaller than I thought (I think 9-10 would look better). But I wear the earrings everyday. the necklace was smaller than I realized. Guess I should have got out some type of measurer and found out what a 'mm' size really is. The Pearls are very beautiful! I have not given them as a gift yet but I am sure she would love them. One thing I wish there had been some paper work in the box or it stamped in the cover of the box as what they were. (DaVonna 14k Gold White FW Pearl Set) would have been nice letting the person getting the gift know what she was getting, instead of just a plain white box. With the price that was paid you would think they would want people to know what they are getting. Beautiful set of pearl necklace and earrings. They feel nice and weighty in your hands. I wish there would have been a nicer box for presentation and storage though. Im very disappointed with Overstock on this one. These look nothing like the quality in the stock picture and they are definitely not even close to AAA grade. If they were like in the picture this would be an astonishingly good deal. But they are not even close. Im really surprised Overstock would allow such a misrepresentation. Every pearl in the strand is not round and they all have flaws that are obvious from as much as 4 or 5 feet away. That being said, these really are not much of a deal at all and quite a let down after relying on the pictures and the grading. I would be embarassed to give these to my wife so they are going right back. Beware-- this deal is too good to be true. Shame on you Overstock! the necklace is poor quality. the necklace feels very poor quality. I was extrimily unhappy with this set. Very elegant... Bought it for my friend birthday and she loves it. What a beautiful set of pearls! Shiny and elegant as all pearls should be! A stunning yet subtle accent to any outfit. Makes for a dressy look that you can only get from pearls! My son bought this set for a wedding gift for his future bride. It is a lovely set. The earrings are the perfect size for a petite lady. These arrived in a greatly packaged, neat container and made the perfect gift for my wife. They are the perfect price and go with almost any outfit. She has been very happy with them. Very pretty! Just what I wanted. "How long is this string of Pearls?" "Is there a matching bracelet for this?" "If I order the 10-11 pearl size on the necklace, what pearl size are the coordinating earrings?" Hello Andrea W., the pearl size for the earrings will be the same as the necklace. Please let us know if you have additional questions. Thanks for shopping with us. Good value, knotted pearls and heavy duty clasp. Because the pearl signifies the symble of a new begining for new sisters that join this particular soroity. The pearl also makes any dress style look clean and fresh. "Are the pearls individual tied"
Hello Sassy Sam, yes these are individually knotted pearls. Thanks for shopping with us. "I read the reviews and several people said that this deal was to good to be true. That the quality was poor, the color bad, and the shape not round. How can I be sure that I am actually buying a good necklace." Hello Baalj, we can understand your hesitance from the bad reviews. Please note there is overabundance 5 star and 4 star reviews versus the 1 star and 2 star. I hope this helps and thank you for shopping with us.